When you get pet chickens, it changes your life… so much so that you may want to write your own chicken blog. You might be surprised how foreign the concept of chicken keeping is to some people, so you may want to share your own perspective! How often do they lay? Are they friendly? How do you put them in at night? You want to share your new joy and knowledge with everyone in your own chicken blog. 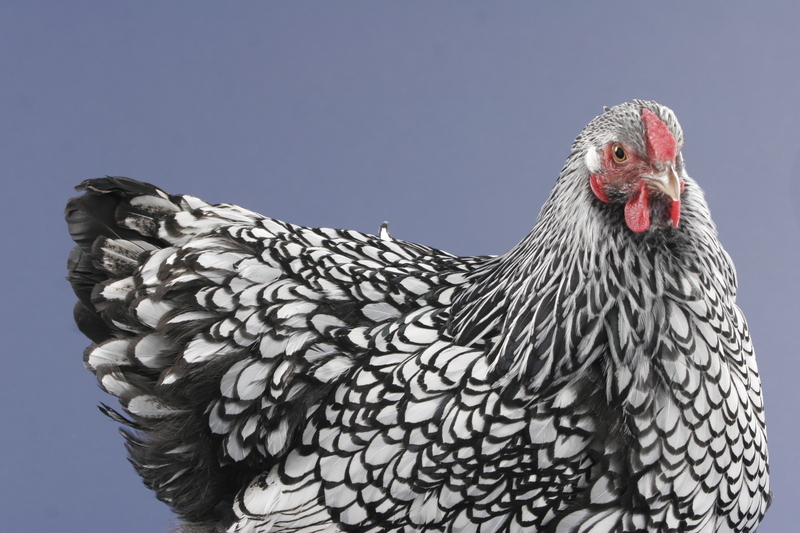 When you have breeds as lovely as this Silver Laced Wyandotte, it’s difficult NOT to want to chicken blog. 1. Write. It may seem self evident, but you need to “close the deal,” so to speak. It’s easy to think of subjects for your blog posts, and somewhat less easy to follow through and actually sit down to write them out. There are hundreds, perhaps thousands of chicken blogs out there, but chicken blog after chicken blog have numerous posts during the first few months of existence and then peter out to nothing within a year. Don’t let this happen to you! Keep a writer’s notebook and jot your blog post ideas down, so you don’t forget them. Write an idea a day, even if you don’t end up blogging about it, and you’ll always have plenty of ideas to choose from. Then set aside time each week to write a post: once a week, twice a week, twice a month, etc. Set a goal you can manage, and then stick to it. 2. Write well. This doesn’t mean you have to be Shakespeare. It doesn’t even mean your writing has to be A+ grammatically perfect. Blogs are conversational rather than formal. But it does mean you should pay attention to spelling—poor spelling will distract from your message—and you should do your best to make your writing clear and organized. A typo isn’t the end of the world, but people should be able to understand what you’re saying without having to piece it together like a puzzle. Remember, you don’t want people simply to read what you’ve written, you want people to experience your personal perspective. 3. Use photos. You don’t need a zillion photos to blog… but you do need good photos. When composing your chicken blog, you should use at least one photo per blog post. (For tips on how to photograph your chickens, you can check the chicken photography advice we share on our blog.) Only a good picture is worth a thousand words. A great picture can be worth far more! 4. Respect intellectual property. This means you should use your own photos, not someone else’s—not photos you find online. And it means you should write your own material, rather than copy and paste something someone else has written. “Don’t plagiarize or steal images” is something one hopes is self evident to most adults, but we include it here because it’s not always adults who are blogging about their chickens (or looking for advice on it); there may be some budding young chicken bloggers out there who want to know how to start. So for those who aren’t aware, you cannot simply appropriate photos you find online. It doesn’t matter if you link to the source of the photo; attribution is not permission. Unless you specifically see a notice stating that an image you find online is free for use, assume it is copyrighted. Even if you ask and receive permission, you may get it wrong. After all, if you’re not asking the photo’s real rights owner, you may be getting permission from someone who can’t give you legal permission. This is why it’s always best to use your own photos. 5. Share who you are. This doesn’t mean you should share your full name, physical address, telephone number and contact information. In fact, don’t do that. No, no, no. But it does mean you should share the person you are with the chickens, share that perspective in your writing. Let us hear your voice (written well). Tell us what breeds you like, why you got into chicken keeping, why you decided to keep a chicken blog, how chickens fit into your life—how they have improved it! Those answers will be different for everyone. Way different, in some cases. For instance, back when I worked in a corporate setting, I’ll never forget the reactions I got when co-workers learned I didn’t have cable at home. They’d ask what I thought about this or that TV show’s twist or denouement, with what I regarded as the rather bizarre and self-absorbed assumption not only that everyone had cable, but that TV was the only possible form of post work day entertainment… AND that everyone watched the exact same things. Really? When I politely explained that I didn’t have cable and wasn’t familiar with the show, many were genuinely stunned and horrified. “But what do you DO at night?! !” one lady asked, an apalled look on her face. At that, I was also a bit horrified. “Am I really speaking to a person who doesn’t even have the capacity to imagine anything other than TV at night?! !” I thought to myself. Um. Well… I enjoy my husband’s company. I read. Write. Garden. Walk. Cook. Plan a party. Feed the birds. Brew beer. Play video games. Crochet. Clean. See my grandma. Fix something. Mow the lawn. Visit friends. Paint a picture… watch chickens. Watching chickens with company can be pretty fun, too. Recommended: porch swing. So when you’re writing your chicken blog, keep in mind that no matter who is reading it, they want to understand your perspective. People who aren’t familiar with chickens will want to hear it, and even other chicken keepers who may share at least a few of your views will want to know what goes on in your microflock as opposed to theirs. What type of person keeps chickens? Lots. Lots of people do. There is not one single type of chicken keeper. Let your readers know who you are in your chicken blog, because some may not be able to imagine it!